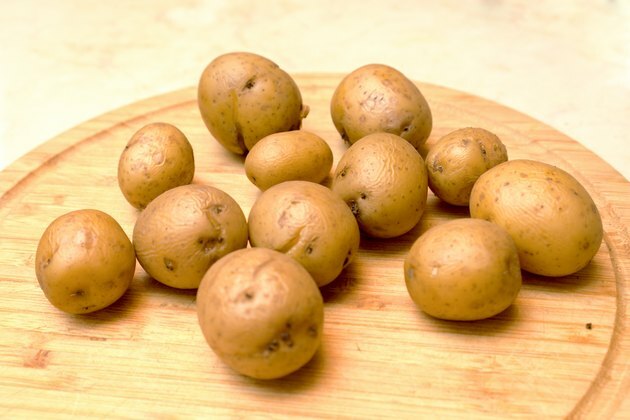 Can You Use Raw Potatoes for Dark Circles Around the Eyes? You're probably accustomed to having your potatoes mashed, baked or fried, but putting them on your face is a completely different story. Potatoes have an uncanny ability to stay cold for long periods; they also transfer antioxidants, such as vitamin C, and other nutrients to your skin. These features make potatoes as good as cucumbers when it comes to reducing dark circles under the eyes. Potatoes contain enzymes, vitamin C and starch that nourish the thin skin around the eyes. The coldness of the potato also helps to reduce swelling and inflammation of the vessels underneath the eye to minimize a dark, tired appearance. Lie down and place chilled potato slices over your eyes for 10 minutes or longer to reduce the appearance of dark circles. Grated frozen potatoes also work well as an eye pack or poultice. Potato slices won't replace a good night's sleep and proper nutrition or trump a genetic predisposition to dark circles -- so don't rely on them to completely erase all signs of fatigue.